When the Mister and I had been dating for a while and things seemed pretty serious, I decided to ask him gently about some of his former girlfriends. I was particularly curious as to why he hadn’t continued seeing one young woman, who was quite beautiful. His reply was “Oh, I could never be serious about her. She didn’t like Christmas!” Years later, I wonder if any other man loves Christmas as much as my husband—his enthusiasm is just shy of that of Buddy the Elf’s. In fact, it probably surpasses it when you take into account that Buddy’s zeal was focused on the North Pole and Santa while the Mister’s is centered on the birth of Christ and encompasses almost every detail of this season of celebration. Even so, we’re kind of picky about our holiday traditions, being firm believers that Thanksgiving should get its due. And we do our best to honor Advent and its deliberate and thoughtful traditions. In years past, we’ve set aside the first Saturday in December to get our Christmas tree. We would bring it home, put it in a bucket of water, and usually have it in the house ready for decorating by the following Saturday. But when a child goes to college, family traditions have to be adjusted, and so today we made the trip to Cedar Mountain, North Carolina, to cut a Frasier fir. Our favorite tree farm is a very small, family run operation. A yellow bow saw is provided. As is a measuring stick, marked up to nine feet. It’s a pretty secluded place. There’s no piped-in Christmas music, and Santa Claus is nowhere to be seen, but Lovely and Little are still on their best behavior. Trimmings are free for the taking, rather than bundled up and sold. Once you have made your selection, just carry it to the cashier, who is one of the owner’s granddaughters. The owner’s son will measure it and then net it for you. At only $7 per foot, it’s easy to see why five trees seems reasonable to the buyer of these fragrant beauties! Big makes sure the tree is ready for the hour-long ride down the mountain. How richly God has decked thee!" Our table is ready, and the feast is coming along rather well, too. 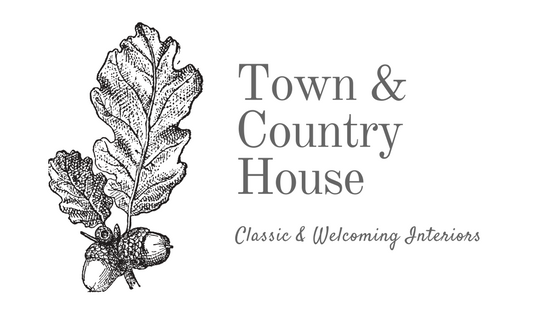 Other than turkey, the T&C house has three traditional dishes that must be served. They are Cornbread Dressing with Sausage and Pecans; Sweet Potato Soufflé; and Nannie’s Corn Pudding. And although I love making cranberry sauce from real cranberries, the Mister and the boys insist on sauce from a can. I used to make both, but, honestly, I have given up trying to convert them. There are worse things than canned cranberry sauce. I do, however, refuse to serve it as a cylinder to be sliced. Nevertheless, my little darlings led by the Mister, usually buy their own can and open it on the sly, and then pass the offensive condiment in its wiggling, shimmering glory. I like to try other vegetables and side dishes from time to time. Everyone always likes macaroni and cheese or mashed potatoes. This year’s menu includes Sweet Vinegar Green Beans and Roasted Brussels Sprouts. Yeast rolls complete the main course. I have a wonderful, time-consuming recipe, so this year Sister Schubert has made our rolls. What a doll. Finally, for dessert we have two pies. One is my all-time stand-by Chocolate Pecan Pie, which is lick-your-plate good. (We don’t, of course, actually lick our plates.) The other is Sweet Potato Buttermilk Pie, which is from the Lee Brothers’ cookbook. I hope you have a wonderful holiday with family and friends—and all your favorite dishes, too. 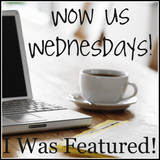 I am so grateful to you for reading and for commenting. You inspire me everyday. If each year is a rollercoaster with ear-popping climbs and careening twists and turns, then surely Thanksgiving Day is the peak, the crest before the final thrilling drop, the rush to the end of the year where as the cart lurches to a halt one must smooth her hair and gather her bag and depart with some sense of decorum. And so. As our cart teeters at the top, tipping slightly forward, into the holiday season, I for one, would like to breathe. For at this moment, I don’t know if I will be clutching the safety bar, white-knuckled and holding on for dear life or if I will be holding my arms up and screaming with delight. Of course, I’m hoping for the latter. So to breathe. To be grateful. To count my blessings, which are, truthfully, too many to count. And to remember. It was faith, courage, and bravery that brought us to the first Thanksgiving. The first Thanksgiving came after leaving home, after suffering, after sickness, after grief. The celebration came after hard work, after toil, after struggle, after compromise. And still after such hardship and loss, people gave thanks and were grateful to God not so much because the worst was over, but because—in their faith, they knew the best was still to come. The above images were taken from N. C. Wyeth’s Pilgrims. Wyeth, father of Andrew Wyeth and grandfather of Jamie Wyeth, was renowned for his illustrations of such children’s classics as Treasure Island and The Last of the Mohicans. These images were commissioned for a series of murals by the Metropolitan Life Insurance Company in 1940. Another book that tells the story of the Pilgrims and Thanksgiving is Barbara Rainey’s A Thanksgiving to Remember. This publication includes the story of the Pilgrims in a read-aloud version for younger children as well as a more detailed version for older children and adults. For a delightful Thanksgiving tale set in the 1820s, Louisa May Alcott’s An Old-fashioned Thanksgiving is a marvelous story that gives a glimpse into a loving New England family. 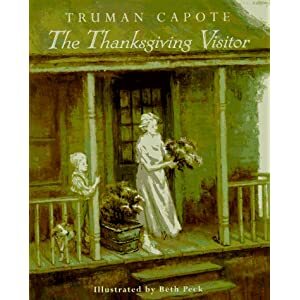 Lastly, for older children and adults, Truman Capote’s The Thanksgiving Visitor is a poignant story not to be missed. I hope you find a moment to breathe a prayer, to read and to ponder, to sit at the top of the roller coaster and appreciate the view. I’ve been thinking about buying some new boots this season. The classic LLBean duck boot comes to mind first. Oh, I know it’s not fashion forward, and I have no plans to go duck hunting. It’s just that I owned a pair for forever—all through college and young adult life, and then when I moved to Florida I got rid of them. Mistake. I would seriously only need footwear like this half a dozen times a year, so I guess it’s nostalgia that makes me crave a pair. I tell myself that I would wear them to walk the dog through the woods. And to pick out the Christmas tree. After all, I have the khakis, the ragg socks, the Norweigan sweater, the plaid Pendleton scarf, and the field coat, for heaven’s sake! I also already have a pair of riding boots, but they’re a bit low on the calf, and they are starting to bag around my ankles. These beauts are from Ralph Lauren, and I think they’re awfully handsome. Of course, they’re available in black, too, which makes for a difficult choice. What about over-the-knee boots and booties? Um, no, that’s not really my style, but these Tony Lama boots for gals? Well, Howdy Pard’ner. Aw, shucks. Y’all know I’m not springing for these, but a gal can dream. I suppose I’m dealing with a midlife boot crisis. As it turns out, however, I do get to buy some new boots. Rather, a new boot, as in one, single boot. Total up the dreamy pairs above, but write the check for one of these state-of-the-art pneumatic walking boots, and a complimentary fitting, of course. Yes, Middle broke his foot, practicing lacrosse. Not to worry, though, because as the Doc said, “He’s going to heal just fine. His growth plates haven’t even begun to close.” Pause. —you know, just for kicks. My perfect Thanksgiving night looks something like this: We are all full of home-cooked goodness, and the kitchen is sparkling once again. We’ve entertained some guests, but now as the purple darkness fills our windows, it is just us. The fire is humming, and the Mister pops in the dvd of Miracle on 34th Street—the original with Edmund Gwenn and Maureen O’Hara. Big, Middle, and Little are all lounging about in front of the fireplace while the Mister and I curl up on the sofa. At my feet sits a basket of Christmas cards to address as I watch this holiday classic. Oh yes, it’s tempting to nod off—especially after all that soporific turkey and dressing, but it’s so much more rewarding to finish this gentle task and look forward to a mailbox full of Christmas cards in the coming weeks. We so enjoy receiving cards each year. I know it's an expensive endeavor--postage alone is costly. But still, even in the world of social networking and emails, I think it's a tradition worth keeping. For the past two years I’ve ordered our Christmas cards online from Shutterfly, and I’ve been extremely pleased with both the quality and the service. And after looking around at a few other online sites, I have to say that I think the prices on the stationery are extremely reasonable. A good friend took the photo we're using this year, and the Mister and I had a lot of fun selecting our card. Shutterfly offers a lot of choices, but, happily, you can narrow them by color, by designer, by number of photos you’d like to use, and so on. We first considered this one, called Holly Peppermint. It’s traditional but graphic and fun, I thought. Also in the running was this tartan card. Of course, I love tartan (more about that later! ), and I thought this one, named Vintage Plaid, looked great with a casual black and white photo. The Mister suggested that we choose a card in which our photo bled off the page. How daring! (Well, for me, at least—I do tend toward the traditional.) We were pretty taken with this one, called simply Merry Xmas 2010.
with the Light of the love of the Savior! I’m so excited to have our cards ready to go, and if all goes according to plan, I’ll be nestled in with pen and stamps on Thanksgiving night. Pitney-Bowes and the American Red Cross have once again combined efforts to send holiday cards to American service men and women and their families as well as to veterans all over the world. 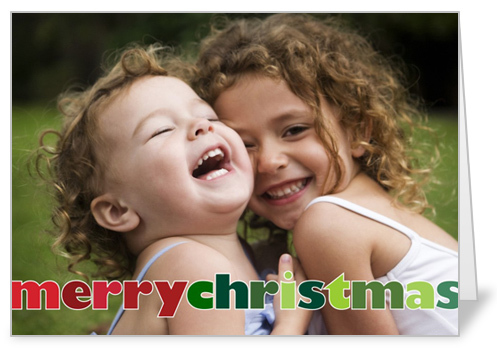 Cards must be postmarked no later than December 10th, to ensure timely delivery. Finally, I am thrilled to tell you that Shutterfly is providing me with a coupon code for 50 free holiday cards this year! 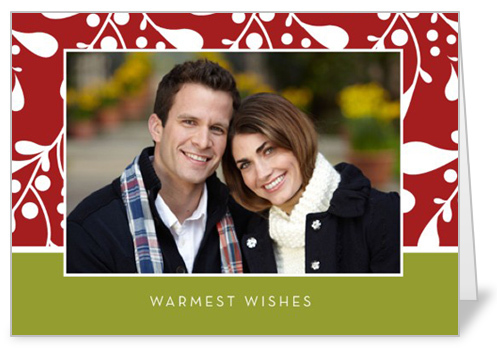 If you are a blogger and are interested in receiving free cards from Shutterfly, click here. And I hope your mailbox is chock full of gladsome tidings this season! The most the Mister and I have ever hosted for Thanksgiving is 23; this year looks to be between eight and 12, which still makes for a full table. I’m fine tuning the menu, and I’m also considering the table. The other night I decided to pull some things out and take some pictures, with the hope that you, dear readers, will offer your suggestions. Usually, for Thanksgiving, I tend toward formal—the old Haviland china, the Hepplewhite sterling with a coin silver spoon for coffee, a white damask napkin in a sterling napkin ring, and—my favorite touch—a sterling nut dish with some sort of treat. I’m not sure I’ll use M&Ms, it’s just what I had on hand for the photo. Most likely I would set the table on a white damask cloth, and use the crystal, of course. For flowers, I’m imagining silver cups with rust-colored chrysanthemums and a sprig of ivy, pine, or fern. Ivory tapers would complete the table. A casual place setting has its appeal, too, though. I’d still use the sterling, but I could switch to a large and heavy pinecone plate (from Target) and a paisley print placemat. The monogrammed linen napkins are always fun to use, too. If I decide to set a casual table, I have a small collection of wooden candlesticks that I would use around an arrangement of mixed autumn flowers in a low wooden bowl. One benefit of the casual arrangement is that we could use our Pilgrim salt and pepper shakers. I bought these at Publix at least 10 years ago, shortly after the company introduced its adorable Thanksgiving commercial. We love using them in the days leading up to Thanksgiving every year. If you don’t have Publix grocery stores in your neck of the woods, or if you don’t remember this darling spot, by all means, click and watch. I am sure it will make you smile. It’s also a great way to teach your children to always pass the salt and pepper together—never separately! So, what do you think, formal or casual? I’m not quite sure when I fell in love with books. Honestly, I can’t remember not loving them. One of the first stories I recall poring over was P. D. Eastman’s Are You My Mother? I loved having that book read to me, and quickly memorized it so that I could “read” it to myself. Another favorite was A Child’s Garden of Verses by Robert Louis Stevenson. Who could resist "I have a little shadow, who goes in and out with me”? 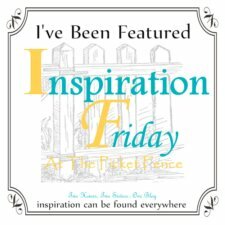 And how could I resist when the inspirational Jessica at The Entertaining House tagged me to name 15 of my most influential authors!? Of course, I couldn’t resist, and so began thinking of who I would name as not merely favorites but as influential. I also began thinking of how blessed I am to have a husband and children who love to read as much as I do. And thinking of that inspired me to retrieve some of my favorite pictures from last fall’s trip to New York, where one of our favorite adventures was finding some literary landmarks. Madison Avenue at 93rd Street is the home of the Corner Bookstore, one of the shops that inspired the Shop Around the Corner in one of my favorite chick flicks You’ve Got Mail. After lunch on Sunday, Big, Middle, and Little were eager to find something to read on the plane home. Little is not a bit intimidated by the Mad Hatter of Lewis Carroll’s novel Alice’s Adventures in Wonderland. Meanwhile Middle and I cozy up to the White Rabbit. Here, Middle pretends to shed a tear as Hans Christian Andersen reads The Ugly Duckling. Middle first heard this story at nursery school, and he was absolutely traumatized by it. Many nights, both at bedtime and in the middle of the night, the Mister and I had to comfort Middle and assure him that the Ugly Duckling did make new friends and that the ducks that were mean to him felt very, very sorry for leaving him behind. Little strikes a pose in front of the New York Public Library entrance on 36th Street. And, unbelievably but truly, an unposed moment in the Corner Bookstore, where everyone found something to read on the plane home. And so, here’s my list of my fifteen most influential authors, some from childhood and some from later. This list, by no means, represents the most intellectual books nor the most entertaining books I’ve ever read, but, rather the writers that have somehow inspired me or changed my thinking, beginning with childhood. Robert McCloskey. Make Way for Ducklings, One Morning in Maine, Blueberries for Sal, Homer Price. As a child, I loved his simple stories and his detailed illustrations. Reading his books made me want to write as well as to draw. Beverly Cleary. Ramona the Pest, Henry Huggins, and all the rest. Beverly Cleary showed me contemporary characters with familiar neighborhood and schoolhouse struggles. Reading Mrs. Cleary’s books made me feel normal. Laura Ingalls Wilder. The Little House books. Lovely stories taught me to appreciate both the sacrifices that it took to settle our country as well as the simple pleasures of fiddle music in the firelight. Louise Fitzhugh. Harriet the Spy. I must’ve read this book half a dozen times. Fitzhugh’s writing made me want to keep a journal, be a spy, live in Manhattan, and eat tomato sandwiches. E. L. Konigsburg. From the Mixed-up Files of Mrs. Basil E. Frankweiler. Manhattan, again. Art, again. And, how intoxicating to consider self-reliance as a child. Catherine Marshall. Christy. My grandmother pretty much insisted I read this. Marshall’s book opened my eyes to the opportunity of relying on one’s faith to give back to those in need. For the first time, I saw teaching as a noble profession and not merely “a job that mothers could have.” I think I read this when I was 12 or so. Margaret Mitchell. Gone with the Wind. Mitchell’s incredibly descriptive prose influenced me as much as her thoughtfully created characters. I read this when I was 13 and first encountering “the Scarletts” in my own little junior high world. Harper Lee. To Kill a Mockingbird. Harper Lee’s book taught me about honor. Eudora Welty. Delta Wedding and others. I spent a semester in college studying Welty, Carson McCullers, Flannery O’Connor, and Katherine Anne Porter, but it was Welty’s unashamed pride of place and innate sense of waiting for the right word that, I hope, continue to influence me. Mark Twain. Huckleberry Finn. I think I read this in seventh or eighth grade, and I know the lessons we were supposed to learn were about racism and class conflict, but what I most remember is how blessed I was to have caring parents. William Strunk & E. B. White. Elements of Style. Occasionally criticized for rather inconsistent grammar advice, Strunk and White’s little manual of style continues to influence my thinking, and, I hope, my writing. Corrie Ten Boom. The Hiding Place. When a young woman writes that she thanked God for the lice because it kept the officers out of the barracks in her German prison camp, well, let’s just say Corrie Ten Boom’s writing continues to influence me to keep things in perspective. Alexandra Stoddard. Creating a Beautiful Home and others. Minimally illustrated, Ms. Stoddard’s books have encouraged me to further develop both my love and discipline for decorating and design. I’ve had the opportunity to meet her twice, and she is just as gracious and inspiring in person. C. S. Lewis. A Grief Observed. I read this book in the aftermath of a grave personal tragedy. Lewis provided the words that enabled me to talk about my loss and begin the healing process. Dr. Luke. The Gospel of Luke. The Acts of the Apostles. The Bible, as you may know, includes many books—some of poetry, some of history, some of prophecy, but Luke, a man believed to have been a physician, wrote of Christ’s life and teaching in great detail. He followed his Gospel with Acts, which chronicles the missionary Paul’s adventures and the growth of the early church. It’s fascinating, life-changing, challenging reading. So, there you have it—15 authors who have influenced my life. I would love to hear who yours are, so consider yourself tagged!